An orchestral Violist is like an athlete – requiring such qualities as stamina, strength, coordination, and of course, a sense of team spirit! 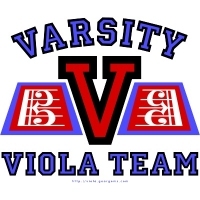 This athletic sporty-looking Varsity Viola Team design is for you – or that aspiring (or accomplished) viola player you know! Buy this design now on a t-shirt, tank top, sweatshirt, hoodie, mug, mousepad or other quality giftware or apparel, exclusively from Bratsche’s Viola Bazaar!